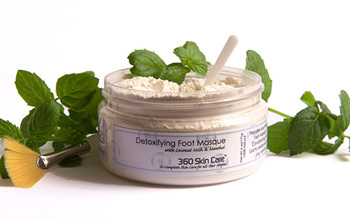 Prepare your feet for the ultimate in foot extravagance, 360 Skin Care’s Detoxifying Foot Masque. After a long hard day, indulge your feet with a touch of luxury. Conditioning Avocado Oil delivers vitamins and nutrients while milk proteins and Lactic acids encourage new cell regeneration. Cover your feet in a layer of bliss as you remove toxins and soften rough skin. Paint brush and instructions included. Devised for use on all skin types.